The Lightning Leech is a deadly little leech pattern that imitates a wide array of forage items. It’s the ultimate fly—its simple, durable, and fools selective trout looking for a large meal. The Lighting Leech is constructed from a brass cone head, a pine squirrel strip, schlappen, and some polar chenille, all the components for a realistic leech imitation. The goal in mind was to create a slim profile, with life-like action combining some flash as a “trigger”. If you enjoy fishing streamers—this pattern is a must-have for your streamer box! The Lightning Leech is a deadly leech pattern that imitates a wide array of forage items. 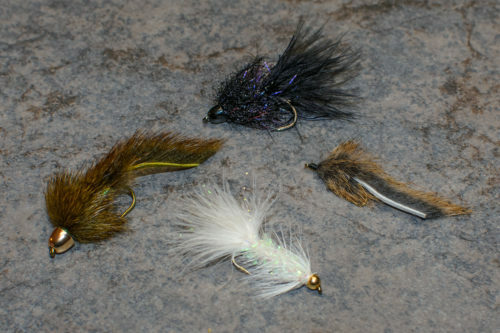 It’s the ultimate guide fly—its simple, durable, and fools selective trout looking for a large meal. The Lighting Leech is constructed from a brass cone head, marabou and other synthetics materials. All the components needed for a realistic leech imitation. The goal in mind was to create a slim profile, with life-like action combining some flash as a “trigger”. If you enjoy fishing streamers—this pattern is a must-have for your streamer box! Leeches provide trout with more bang for their buck and they rarely refuse the opportunity to eat one. You can opt to dead drift a leech or strip it as a streamer. When we dead drift a leech, we recommend using it as an attactor and trail a small midge or mayfly behind it. In most cases we strip the Lighten Leech with a traditional down and across delivery. We have found that a slow retrieve produces the best results, but don’t be afraid to think outside the box from time to time and mix things up with a quick retrieve.